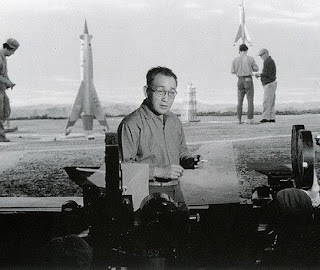 Though styles apart, along with his American counterpart Ray Harryhausen, Japanese tokusatsu (special effects) wizard Eiji Tsuburaya left an indelible imprint on my childhood sensibility. Balanced with the coming-to-life of the bronze Talos statue in Harryhausen's Jason and the Argonauts are the images of Godzilla ravaging Tokyo. No wonder I was always begging my mom to let me go to the movies! Imagine my delight that—in conjunction with the Chronicle Books publication of San Franciscan author August Ragone's impassioned visual biography Eiji Tsuburaya: Master of Monsters—Landmark Cinemas and San Francisco's Clay Theatre hosted a Tsuburaya double-bill of Battle In Outer Space and Mothra in dazzling Tohoscope, with Ragone in attendance to introduce the films and sign his book. My thanks to Bruce Fletcher of Dead Channels for alerting me to same. Anticipate an interview with August Ragone in the next week or so. I would be hardpressed to outdo Ragone's own synopses of the films at his site The Good, the Bad, and Godzilla, where he has written up both Battle In Outer Space and Mothra. But I would like to share some of my notes from Ragone's slide-illustrated introduction to both films, which supplement his blog entries. Yoshio Tsuchiya, who plays Iwamura—the character who becomes possessed by the aliens—spent a lot of his career either in Akira Kurosawa's films or playing possessed madmen or monsters in these science fiction films. 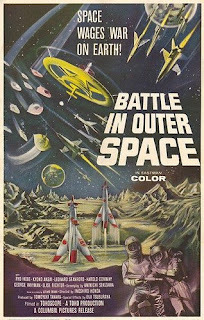 At that time at Toho Studios, their ensemble of actors were under contract to perform in whatever projects Toho was producing, whether Kurosawa's arthouse films or these science fiction genre films. Ragone made a keen point of noting critical prejudices at the time against genre films. One of the critics who complained that none of the actors in Godzilla could act—a film in which Takashi Shimura played paleontologist Dr. Kyouhei Yamane—overlooked that when Shimura played the war-weary samurai Kambei Shimada in Kurosawa's The Seven Samurai, this selfsame critic proclaimed him as "one of the most important actors in the world." Ragone offered slides of the original concept designs for the aliens in Battle In Outer Space, which proved to look quite different from what production costs finally allowed. He highlighted Shigeru Komatsuzaki's concept designs for the space aircraft. His slideshow included several production stills of Tsuburaya on the set of Battle In Outer Space (which I note are not included in the book) and detailed how some of the effects scenes were accomplished, especially during the final battle on Earth when the aliens invade with their anti-gravity beam. Tsuburaya and his technicians filmed in an area below a suspension bridge with wires on wheels, which allowed them to pull up the miniatures and to shoot their ascension in natural light. The miniatures were made of brittle wafer-thin paraffin, which—along with being blown around by big fans—could easily be lifted by wires. The scene was shot with two cameras. Tsuburaya frequently employed multiple cameras—a technique often ascribed as Akira Kurosawa's signature brilliance—but, Tsuburaya filmed this way as well. After nearly 50 years, this effects scene still proves thrillingly impressive on the big screen in color in Tohoscope. A whole layer of comedy was added by the film being shown in its dubbed version. In one of the production stills where the two miniatures of the rocket ships are shown on the surface of the moon, Ragone pointed out how one of them looked a bit unfinished or rough because it was about to be blown up. Introducing Mothra, Toho's largest scale kaiju eiga (monster movie), Ragone offered original concept designs of Mothra as a big horrible monster. The script was softened into something of a fairy tale by screenwriter Shinichi Sekizawa who based his screenplay on the stories by Shinichiro Nakamura, Takehiko Fukunaga and Yoshie Hotta. The look of Mothra was adjusted accordingly. 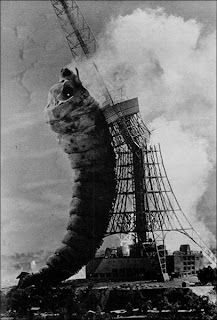 In a production still of Mothra in its caterpillar phase, a 30-foot costume manipulated by seven individuals, Ragone pointed out the meticulous background details of well-tended fields, which prove barely noticeable in the film itself. Sometimes the cameras were so low on the set, you couldn't see these details. 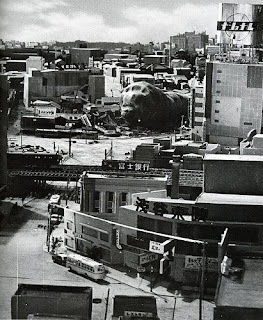 Offering a production still of the 1:50 scale miniature set of the Shubiya ward ravaged by the larval Mothra, Ragone could confirm its "staggeringly perfect" accuracy, having lived there for a while. Though he didn't live there in 1961, many of the buildings are still there, like the Fuji Bank and the movie theatre. Shubiya had many movie theatres and—again emphazing Tsuburaya's near-insane mania for set detail—Ragone translates one of the movie marquees in the production still as Elmer Gantry. Ragone showed a slide of Tsuburaya on the massive set for New Kirk City, which Mothra attacks in the film's final sequence. New Kirk City is located in a fictitious Western country called Rolisica, which Ragone identifies as a combination of Russia and the United States. "Just because they didn't want to blame any one country for bombing Infant Island and releasing all that bad stuff that happens in the film; all that bad karma." Columbia Pictures wanted a more spectacular ending to the film for distribution in the United States—the original ending was situated in the mountains of northern Japan—so they financed the tacked-on scene where Mothra attacks New Kirk City. The Peanut Sisters, twins Yumi and Emi Ito, were cast as Mothra's "Little Beauties". The reason Mothra was scored by Yuji Koseki and not Akira Ifukube—who customarily scored all of Toho's science fiction films—was precisely because Koseki had a longstanding working relationship with The Peanuts and because Tsuburaya wanted a more operatic score for the film. Ragone stressed that the reason a film like Mothra did so well at the box office not only in Japan but in its import to the United States was because it was a good movie, with special effects that were state-of-the-art for the time. Forty years later a "little sense of wonder" might be required to appreciate Mothra; but—in my estimation—it doesn't take much; the film still whimsically enchants, especially in its original Japanese-language version. Ragone was asked if he had ever considered writing a script with a new conception of Godzilla and submitting it to the Toho Studios? No, he replied. He's had friends in the past submit story ideas to Toho that were appropriated by Toho and worked into films they were already making without any kind of credit or compensation. Basically, he explained, the way Toho looks at it, if you're writing about Godzilla, they automatically own it. There are no intellectual property rights, especially if you're a little guy and not a big guy with deep pockets. Preceding both films was a short Japanese documentary on Tsuburaya with a rich sampling of clips from his films that helped contextualize the rich value of his legacy. 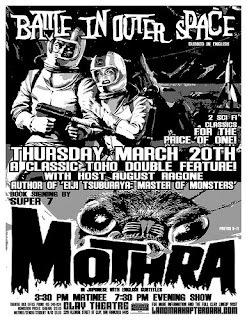 Mothra on the big screen! I wish I could have been there. Ah . . . to be nine years old again. Peter, as ever, thanks for swinging by to comment. Watching a film like Mothra on the big screen in stunning Tohoscope is a true time capsule all in and of itself. A way-back machine. 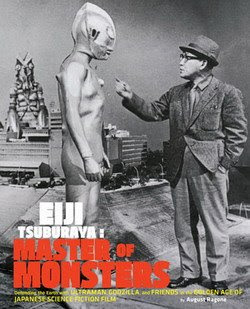 Tsuburaya himself has said: "My heart and mind are as they were when I was a child. Then I loved to play with toys and to read stories of magic. I still do. My wish is only to make life happier and more beautiful for those who will go and see my films of fantasy." 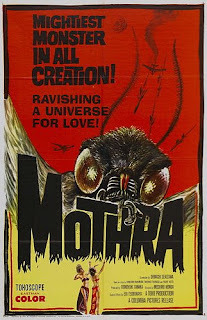 MOTHRA is particularly notable for it's virulent (and often hilarious)anti-Americanism. The explicit (albeit minature)destruction of iconic American companies, the evil Mr. Nelson and the destruction of New Kirk City are worth the price of admission alone. Twas truly a great night at the movies. Hey Bruce, thanks for stopping by to comment. It really was a fun evening, wasn't it?